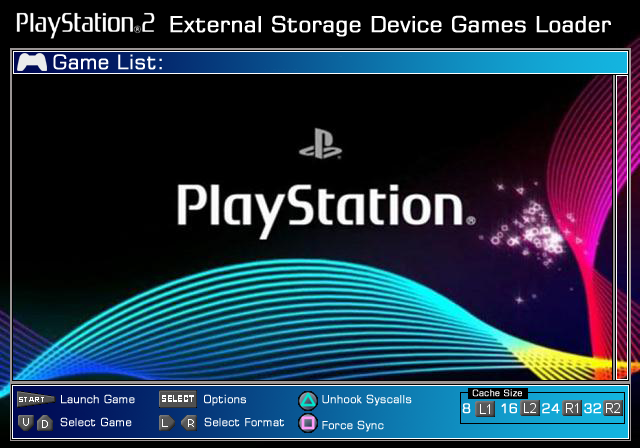 The Playstation 2 External Storage Device games Loader (PS2ESDL) is a Playstation 2 game loader made by SP193. 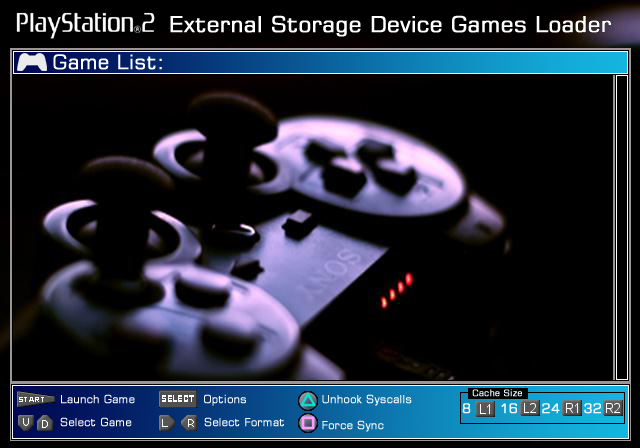 (Currently only USB devices with USBExtreme, ISO9660 disc images and it's own PS2ESDL). 1. 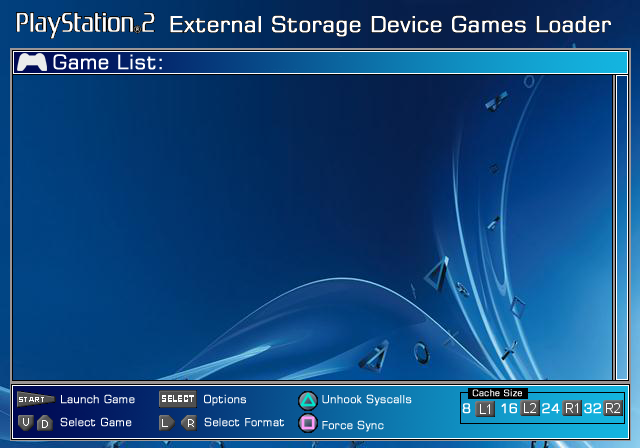 Download the latest copy of PS2ESDL. 2. Uncompress PS2ESDL.elf and patches.ppi into your USB disk. The FAT32 filesystem must be used. NTFS is not supported. 4. Defragment your disk (Your games should be 0% fragmented). PS2ESDL assumes that your games files are contiguous (Not fragmented). I've been using the Auslogics Disk Defragmenter. !!! Do not use the Windows Defragmenter nor Power Defragmenter !!! 5. Start PS2ESDL and run your games. Use left or right D-PAD to navigate between file formats. Up or down D-PAD to select game. Press either CROSS, CIRCLE or the START button to start a game. Hold any buttons and/or triggers you need to enable the desired compatibility modes, and to set/override the default cache size. 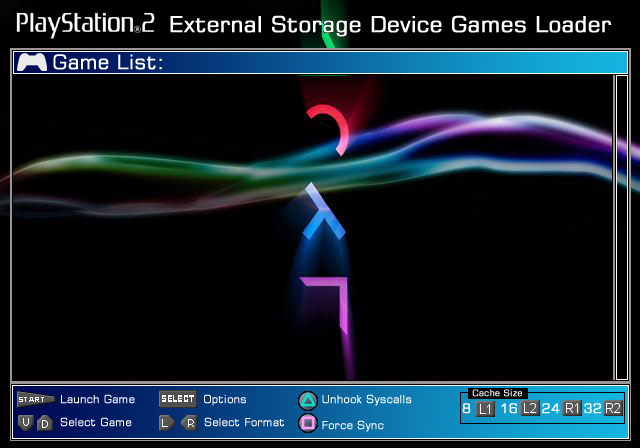 If you used PS2DCDMP to install your game, you may still hold the buttons/triggers to set any compatibility modes that were not enabled at install time, and to also change the cache size. 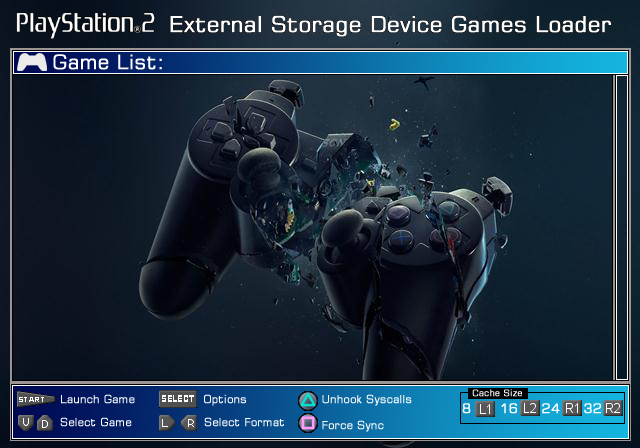 "Unloads" PS2ESDL after the game is loaded. Some games crash without this option. Some games that time out when data is being read too slowly need this (E.g. FFXII and Viewtiful Joe). A larger cache size usually means better performance.A cache that is too big can cause your game to crash.Choose only one of them. The default is a 2-sector cache (When no triggers are held). Hold the required combination of buttons/triggers as your select your game. SELECT: Open the options/configuration menu. SCPH-10000 and SCPH-15000 consoles are also supported! 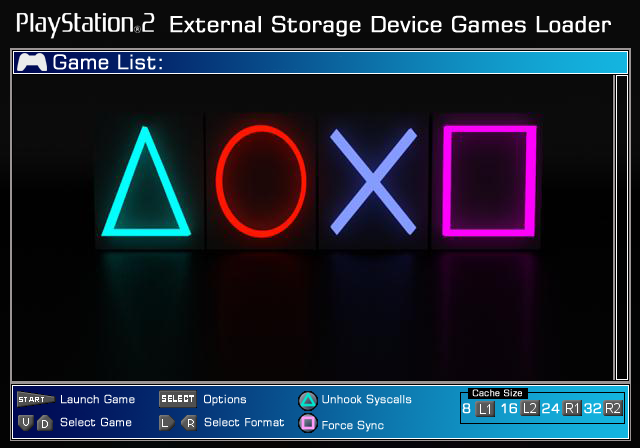 PS2ESDL supports the traditional USBExtreme, ISO9660 disc images and it's own PS2ESDL game format. 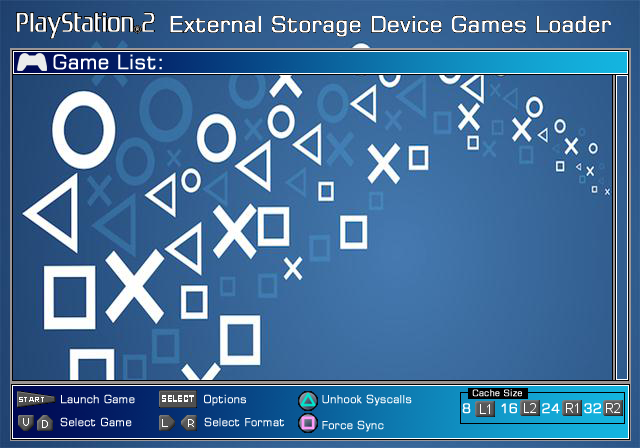 PS2DCDMP is PS2ESDL's native game installer, and can be found here. How to install: Place the plugin into the same place where PS2ESDL is launched from. Your plugins should be named as extensionX .plg (Where X is a number from 0 to 3). Place your plugins into the same folder where PS2ESDL is launched from. 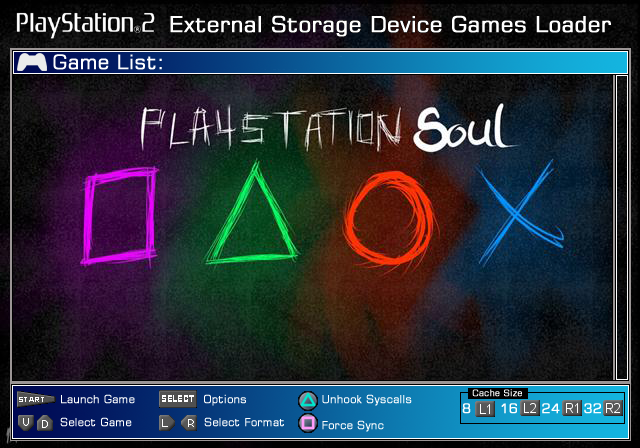 NOTE: PS2ESDL will load games from the first device it finds games on. PS2ESDL v0.820 supports skins too. Place your skin in the directory where PS2ESDL is launched from. NOTE: Not all skins will have a skin parameter file. If PS2ESDL can't load a background from locations a, b, nor c when it was launched, it'll then only keep trying to load one from d.
The background can be smaller in size (It won't be stretched nor centered). The width and height of the background image MUST be divisible by 4. PS2ESDL will not load and display images that exceed a size of 640x448. These files should be placed in the same folder as PS2ESDL. 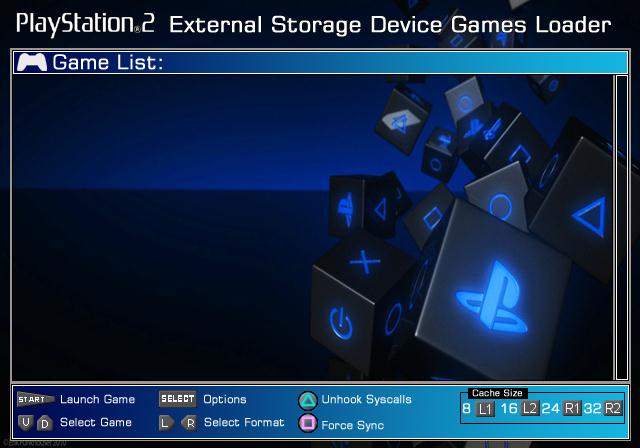 With the SkinParaBuild utility, you can create a configuration file to shape PS2ESDL's UI for your skin. SkinParaBuild is a Command Line Interface utility. View the included MS-DOS batch file for a working example. SkinParaBuild -HideVerNumInGameList=1 -VersionDispX=600 -VersionDispY=450 -oUI.dat Enables the Version Number display in the UI, displaying it at X=600 Y=450. PS2DCDMP v0.99 supports only the PS2ESDL v1.22 game format! If you are using an older format (E.g. for PS2ESDL v0.810 and older), please use the upgrader utility. PS2ESDL has a game compatibility list. Click Here. - Added the play history updating functionality from FMCB. - Fixed sceCdGetReadPos(), which was returning the number of sectors read instead of the read offset in bytes. - Readded the EESYNC module to prevent DNAS games from wiping memory after every IOP reset. - Recompiled with the latest PS2SDK, partly for compatibility with the PlayStation 3. PicoDrive for the Playstation 2 project homepage: https://sites.google.com/view/ysai187/home/projects/ps2esdl. 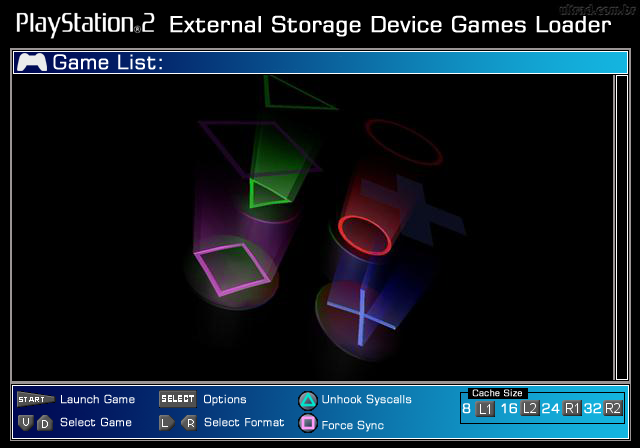 Original thread: Playstation 2 External Storage Device games Loader (PS2ESDL). Updated Download link to new site.